Welcome to the latest installment in our retrospective on Team17’s first 100 games, celebrating the release of game number one hundred, PLANET ALPHA! In this chapter we cover 2016, a big year of partnerships with some of the most talented developers in the games industry and two of our biggest games in recent memory. Read on for the full lowdown, including interviews with the developers behind Worms W.M.D and Overcooked! Missed a previous chapter? Head back to 2015 or start at the beginning in 1991! As well as developing and publishing full releases, Team17’s games label can also help developers bring their games to other platforms, and that’s exactly what happened in 2016 when the brilliantly talented UK studio Roll7 needed help bringing two of their games to Xbox One. The first of those was OlliOlli2, the sequel to Roll7’s critically acclaimed side-scrolling skateboard game. With a game as good as OlliOlli, it was a no brainer to get involved, so we helped get the Xbox One conversion developed, including a brand new Free-Skate mode – a little something extra for Xbox players who’d had to wait a bit longer. XL Edition was very well received, with a string of 8-9/10 reviews, reflecting the quality of Roll7’s design. Pure Xbox called it “the best version of Roll7’s stellar skateboarding game”, while XBLA Fans went even better and declared it “the finest skateboarding experience on Xbox One.” All told, this is yet another release Team17 can feel extremely proud to have played a part in. Part of the same partnership as OlliOlli2, the “Super Snazzy Edition” of Not A Hero took what was already an incredible modern-retro arcade shooter, brought it to Xbox One players and added the “Me, Myself & Bunnylord” campaign, allowing players to control the previously unplayable Bunnylord across three new missions. 10 Minute Tower is unique among Team17 developed games because, over a nine-year span, it’s our only in-house creation not to be self-published. That’s because it’s a very special case, part of a charity compilation called HELP: THE GAME. Designed to raise money for UK charity War Child, to help children affected by conflict, the HELP: THE GAME compilation featured 12 small games, developed by top game studios in just six days, as part of a global game jam. Some fantastic game developers such as Rovio, Sports Interactive, Sumo Digital and even LA Cops creators Modern Dream all contributed games to the compilation. Team17’s game, 10 Minute Tower, was created by nine Teamsters and was a block-moving puzzle game set in the imagination of a child. Players could take control of a robot, for example, to push heavy blocks, or become an astronaut to defy gravity and leap over blocks. 10 Minute Tower is still available on Steam as part of the HELP: THE GAME compilation, so if you want to play some small creative ideas from a host of top game developers while also helping a good cause then be sure to check it out. If you’re reading this then you probably don’t need to be told how special Overcooked! is. If for some reason, you haven’t played it yet, then why not find a friend who has it and try taking on a few kitchens together. The better you are at communicating, the better able you’ll be to survive the cooking chaos and have a great time in the process. Or maybe you’ll descend into the chaos and become comically frustrated with your teammates. Which can be pretty entertaining too! By this point in Team17 history, 27 of our first 86 games had featured the word “Worms” in the title. Many were popular, and played for thousands of hours, but which was the best? On a personal level we might all have our own favourites (this writer is particularly partial to Amiga’s Worms: The Director’s Cut) but the overwhelming message we received from the majority of fans over the years is that 1999’s Worms Armageddon was the high point of the series. With those fans in mind, we’ve attempted to recapture the magic of Armageddon a few times over the years, but when it came time to create “Worms 2016”, the desire to create a spiritual successor to Armageddon was at the very heart of the project. “Some of us working on Worms W.M.D had worked on Worms Armageddon and Worms World Party. So, alongside the fans, it was our favourite too,” says lead designer John Eggett, who worked as a mission designer on Armageddon during his first years at Team17. 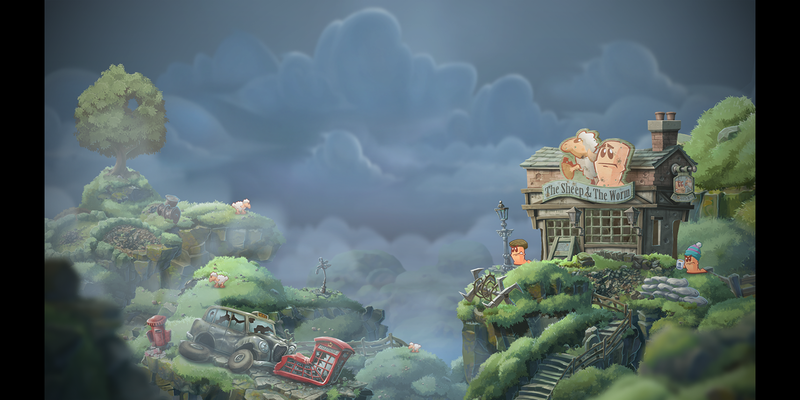 Eagle eyed players may also have noticed that those beautiful landscapes now randomly generate in a very different way to most previous Worms games. “We didn’t want just a landscape mask with a fringe and repeating texture,” says Eggett, “but we still wanted random landscapes and we wanted each one to look hand drawn. Our solution was to use individual components that would be stitched together. A landscape template is used that determines, randomly, the starting land pieces. Each land piece has nodes that depending on a probability ‘grows’ by picking another land piece until we have a full landscape.” Though this feature isn’t one you’re likely to have seen mentioned in reviews, it remains the one Eggett is most proud of today. By building on the physics of Worms Armageddon while adding in original gameplay features and beautiful 2D art, the aim with Worms W.M.D was to create the ultimate Worms game, and we really think we achieved that. In fact, we’re so happy with it that there hasn’t been a new Worms game for almost three years since – the longest gap in Worms history to date – because we want as many fans as possible to take the time to play and see what we’re so proud of. Another first for the Team17 games label, Lethal VR was a 100% VR game, made by Three Fields Entertainment, headed by industry legend Alex Ward and other ex-members of Criterion, responsible for Burnout and Black. That’s all for 2016! In the next instalment, we’ll be looking at the games of 2017, including The Escapists 2 and Yooka-Laylee! While you wait, why not check out our previous history chapters, starting in 1991 or tell us your favourite T17 game by using #100Team17 on Twitter!